Your lab is in the field of computational biophysics - what does biophysics mean to you? Biophysics is a very broad term that can mean a lot of different things. I am particularly in the field of molecular biophysics, which is the physics of systems composed of molecules and macro-molecules that are inspired by systems that you would find in organisms. One good dividing line that I've heard between biophysics and fields like biochemistry or biophysical chemistry is that the work that I do doesn't involve any breaking or forming of bonds - that's what keeps it on the physics side. It is basically everything that happens as a result of the wet (liquid or fluid) state of biological systems at the molecular scale. These are systems that are at room temperature or body temperature, and they are fluid. There are interactions between molecules that are not covalently bound but still affect how they behave. You use a tool called molecular dynamics simulation. What does that mean? Molecular dynamics simulation is probably the most widely used tool in the field of computational biophysics. At its core, it is a really simple technique - it just means that you are making a virtual box of particles, each of which can represent an atom or a molecule, and you specify how the force between them changes with distance. Then you numerically integrate Newton's equations, incrementing the time step and updating the positions and velocities of the particles based on the accelerations you calculate using the forces. The core of it is the kind of thing that you could learn in an introductory physics class. Where it gets complicated - the hard part - is making the systems and interactions realistic. You want to capture the interactions between atoms in a realistic way while keeping the system computationally feasible. Whenever you make it more realistic, it increases the amount of computer time it requires, so that is the tradeoff. A lot of the challenges also come from doing the interpretation of the results. Although we use widely available software, the analysis and interpretation takes most of the time. It can be like finding a needle in a haystack. When you see a cartoon of a molecule in a biology textbook, they have hidden all the pieces and atoms that don't matter, but in our case, all of those atoms are there. Picking out which are the interactions driving the behavior we see is surprisingly difficult. It involves building analytical models for what we think is happening in the system and then comparing the data to those those analytical models. If there is a match between the models and what we see in the simulation, then we can identify the important interactions. 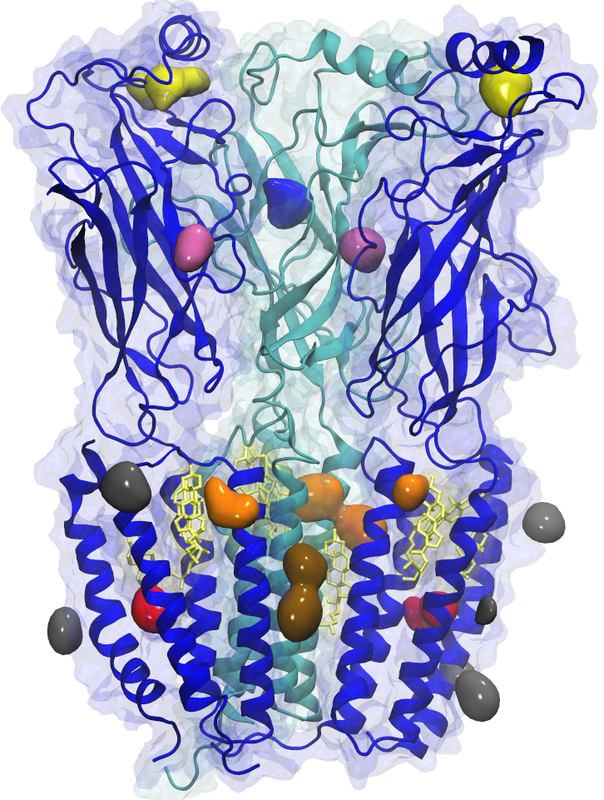 For example, one system that is good for molecular dynamics is the simulation of membranes. Membranes are formed with lipids - the lipids are not covalently bound to each other - they are in a fluid phase. The membrane will have different properties - the flexibility of the membrane and the thickness of the membrane - these things will depend on what type of lipids you have in the membrane and how they interact. To get a realistic simulation, you want to have the simulation be as big as possible - ideally you would want to simulate a membrane that's as big as a cell, but actually that's not possible. How did you get into this field? Did you encounter it as an undergrad or later in your career? I went to a small liberal arts school, Reed College, where I was a physics major. The summer after my junior year, I did an internship at UC San Diego in a group that was recommended to me by a professor at Reed - he thought it would be a good fit. This group was a computational biophysics group working on the protein folding problem, which was one of the first areas where computational biophysics really became important: How does a protein know what 3-dimensional structure to form just based on its sequence? I was just there for a summer but I really became addicted to the techniques - it seemed really fun. I liked being able to visualize the trajectories - what you end up with is like a movie of these interactions in the system that you can't get experimentally. I knew at that point it was something that I wanted to do. My Ph.D. [at UC-Santa Barbara] was in a traditional physics program, but my advisor was also in chemistry. And then I did a post-doc at Penn for a professor in the chemistry department, so I straddled the line between physics and chemistry departments for a while. How did you end up at Rutgers? I came to Philadelphia in 2006 for my post-doc at Penn, and when I was applying for faculty positions, Rutgers was building a new interdisciplinary center in Camden, just across the Delaware river. The opportunity to shape how the Center [for Computational and Integrative Biology] grew was very exciting for me. What kind of research are you working on now? What are you excited about in your lab? My research now is focused primarily on processes that involve signalling across membranes, and particularly synaptic membranes, which includes receptors for neurotransmitters and other signalling proteins. These are hugely important for the central nervous system, which is my main focus. They are also very challenging to get a handle on experimentally because these processes involve a lot of small molecules - lipids, steroids, neurotransmitters, and also drugs. There are a lot of small molecules that are going from point A to point B in these molecular systems, and it is very unclear what the pathway is. This is a really big problem for drug design and for understanding how drugs that target the central nervous system work. It's also a really big problem for understanding the ways in which the lipid composition of membranes - which are affected by our diet and other health issues - can affect receptors to influence cognition or neuromuscular function. I'm really excited about some predictions we had made maybe ten years ago about how a lot of these small molecules should be interacting with a certain group of receptors that's really important, and a lot of the response from the experimental community was extremely skeptical. For instance, one of the theories that we had involved lipids binding to a certain protein in a very strange place that was very counter-intuitive to biologists in the field - it didn't fit with their idea for how these interactions should look. In our simulations, according to classical physics, these were very favorable interactions. Eventually, experimentalists were able to get structures of the protein with lipids bound, and lo and behold they were bound where we had predicted. With these positive results, I have had more experimentalists who are excited to work with me and my group so we are trying to test more of the predictions that we have made using simulation, and that's really exciting. In some cases, experimental biologists weren't thinking about a system in a particular way, and we have been able to offer a potential experiment for them to do to investigate whether a certain mechanism was happening. Our simulations can serve as a smart hypothesis tool that allows them to interpret their experiments a lot better. Other times, experimentalists will come to me and say, "We see this strange behavior - when we expose our protein to this one molecule it has a positive effect but when we use a slightly different molecule that is structurally very similar, it has the opposite effect - why is that?" And we can do a simulation of the protein interacting with both of those molecules to figure out if any of the changes we see in the protein's behavior are linked to the function and whether it is linked to the molecule being there. What applications are there for the kind of research that you're doing? The broad application for our research is to help make better predictions for how small molecules will interact with membrane proteins. The specific receptors that form most of the research in my lab are targets for a lot of drugs, especially general anesthetics. We actually still don't have a really good idea for how general anesthetics work even though we've been using them for almost two centuries. They include drugs like Xanax or Valium or nicotine. As with a lot of drugs that act on the central nervous system, it's just not understood how they work - where do they bind on these proteins or what are the key interactions? These systems are not well understood because many of the shortcuts used in drug design are for soluble proteins and not membrane proteins. We have worked on a lot of implementations that avoid these shortcuts, optimizing them so they are not prohibitively expensive. In some of our research, we have discovered insights into ways that could specifically improve general anesthetics so that they would have a higher affinity for these specific receptors. You also have an administrative role in your graduate program. What does that involve? I'm the director for the graduate program in Computational and Integrative Biology, which is the interdisciplinary center where I am a professor. My role includes helping with graduate admissions and making sure that students are on track for their PhDs. My favorite part of it is the opportunity to interact with PhD students other than my own - there are 25 PhD students in the program and only 3 are in my lab. I think of the PhD period as the adolescence of a scientific career - who a student is when they come into the program is very different from who they are when they come out, so it is a really rewarding opportunity to help mentor all these different students that may be doing projects that are very different from my own research but that have similar experiences. What do you remember about your time at Blair? Are there teachers or classes that stand out in your memory? I was only at Blair for three years because I graduated a year early and went to college, but I remember a lot from my time there - it was a very formative time for me. The teacher that stands out the most for me has to be Mr. Donaldson. I also remember Mr. Bunday, and I had really cool physics teachers in college as well, and I think that really contributed to driving me to the path of physics. I remember a physics class with Mr. Donaldson that was a double-period where every other week we would discuss scientific controversies or recent news. I always really liked those classes and it got me into a mindset fairly early on that science is a process and something that is done by a community that involves a lot of discussion. I went to a liberal arts college where we had a lot of seminar classes and conference classes in the humanities, but even there we didn't have classes in science where we were sitting around discussing things - it was always in a lecture format or a laboratory format or a problem-solving format. So Mr. Donaldson's discussions made a big impression on me - that it is a useful and exciting thing to have in a class, to teach students how to talk to one another about science - and it is something that I try to practice with my own students. I also had some personal challenges in high school, and I probably tried the patience of some of teachers in the Magnet, but they were all so helpful and supportive in allowing me to graduate a year early. I look back on the teachers very fondly, and Mr. Donaldson especially stands out in my memory for helping me learn to balance different forces in my life and to continue my scientific and academic development. Are there things you learned in high school that have stuck with you in your career? One thing that is a common sentiment among physics professors is that students who come in who had calculus in high school or community college tend to do much better than students who have calculus for the first time at the college level, which is often taught as more of an abstract mathematics class. When I was at Blair, I had two years of calculus, including a second year of vector calculus. The reason I think students with high school calculus do better is because the high school and community college classes are much more applied. For me, having the second year of applied vector calculus gave me a really big advantage when I went into college and even in graduate school, where I had this toolbox that I was extremely comfortable with, which was not the case with other students. Even though they were very smart students with a lot of good training, they just were not as comfortable with these mathematical tools. That was something that at the time I did not anticipate would be really useful for me, but it has been really helpful. The second thing is the early exposure to computer science. I started taking programming at Takoma Park, in middle school, and many scientists don't start learning how to program until they're in graduate school. I have realized that since I started taking computer science at such a young age, it makes it challenging for me to teach other people because it's hard for me to remember what it was like before I knew how to think like a computer. I think it's a real shortcoming in secondary education across the country, and when I tell other people that I started taking these classes in junior high in the 90s, they are surprised. I didn't realize it at the time, but I am grateful that I got that from Takoma and Blair.